This rough framed print was one of my October Fall Finds. I really purchased it just for the frame. 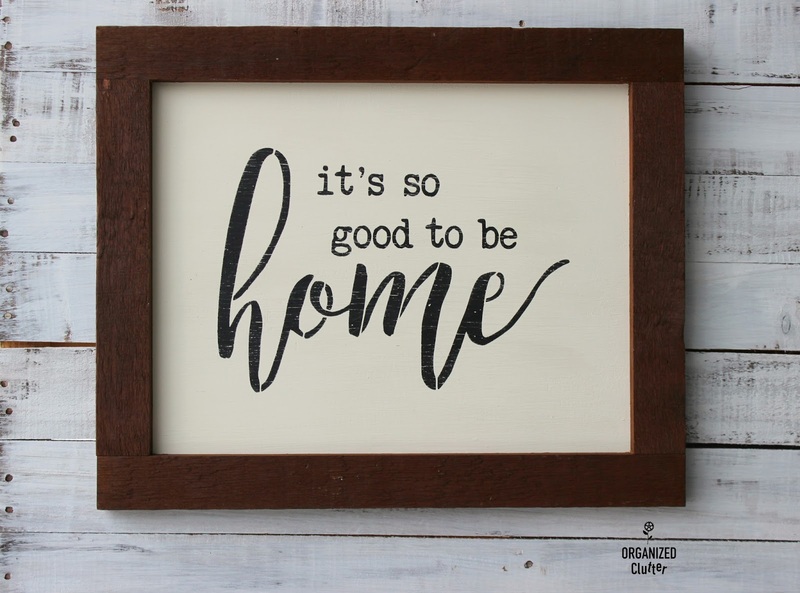 I used this frame for a gift I made for my older daughter! I used another thrift shop frame for a homemade gift for my younger daughter too. First I stained the frame with Varathane Premium Wood Stain in Dark Walnut . 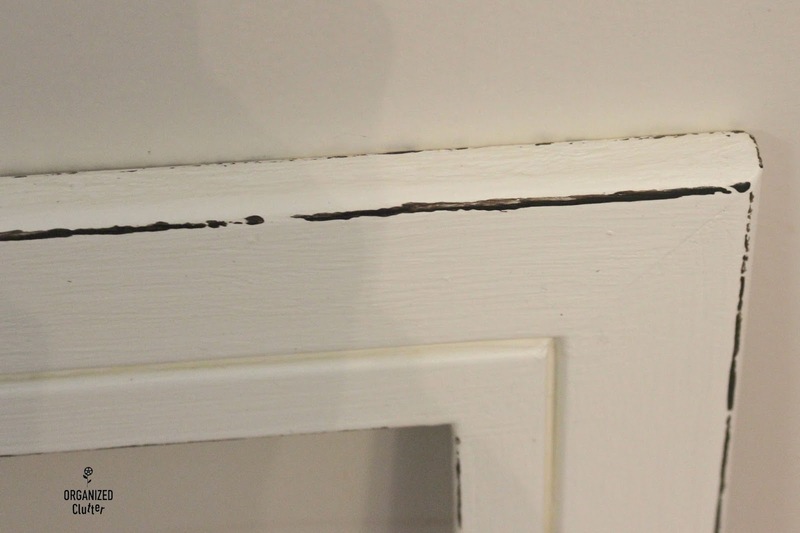 Then I cut a piece of unfinished bead board paneling to fit the opening. I painted the smooth side of the paneling with 2 coats of Annie Sloan Chalk Paint in Old White. I then pulled out the stencil I purchased on Etsy and stenciled the lettering with Ceramcoat Acrylic Paint in Black . I then sealed the stencil and chalk paint with Minwax Paste Finishing Wax in Natural . I am getting some mileage with this stencil! My other projects made using this stencil here. 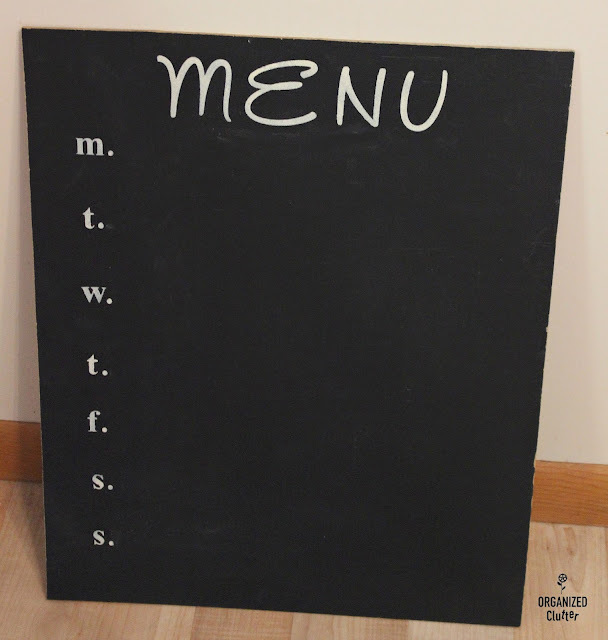 My youngest daughter wanted a menu board chalkboard. I pulled out my Momenta 2" Alphabets Adhesive Stencil for the word menu. I cut a piece of Home Depot chalkboard sheet to fit my thrift shop frame. I used Momenta Alphabets and Numbers Adhesive Stencil for the days of the week initials. I laid a ruler down on the edge of chalkboard using the width of the ruler as my left edge and spacing the letters 1 1/2" apart. I stenciled the letters on with Ceramcoat Select Multi-Surface Paint in Ivory . The multi-surface craft paint need not be sealed to protect the paint on the chalkboard. It's fully cured in 21 days, and is water resistant. I used the dot on the "j" for the initial periods. 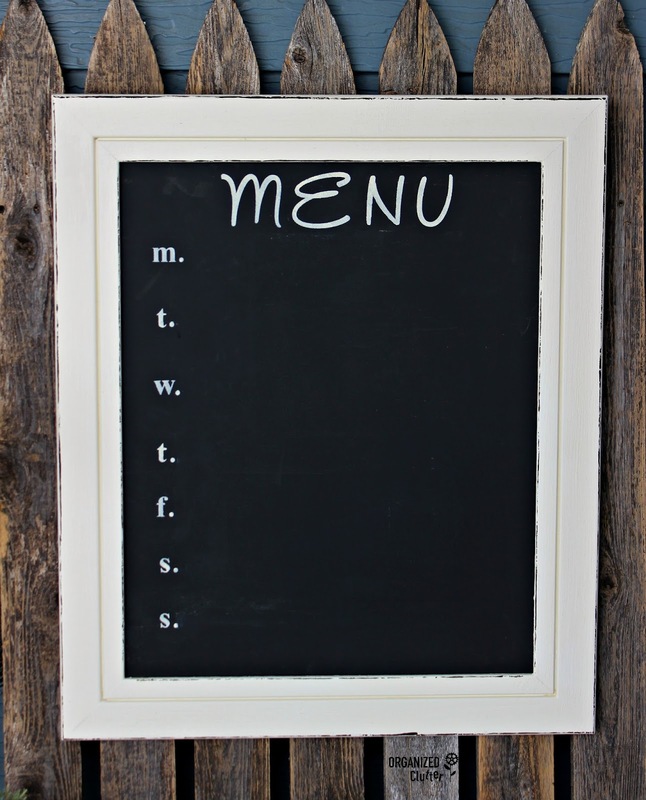 Here is my stenciled menu board. 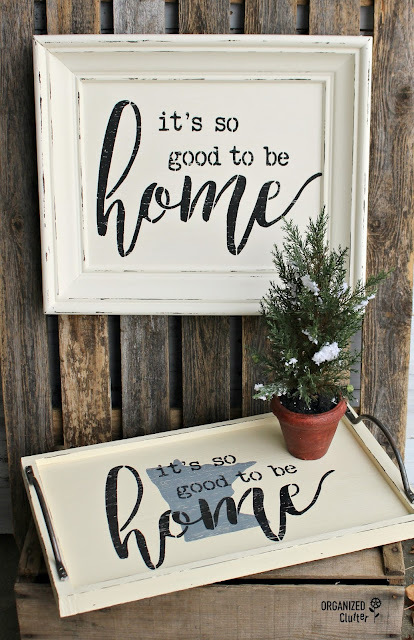 I painted my thrift shop frame with two coats of Annie Sloan Chalk Paint in Old White, and I faux distressed the edges with FolkArt Layering Wood Block and Ceramcoat Acrylic Paint in Walnut Noyer . Close up of faux distressing. I sealed the frame with Varathane Crystal Clear Water-Based Polyurethane in Satin Finish . And here's my finished menu board! Love both frames update. Great gifts! 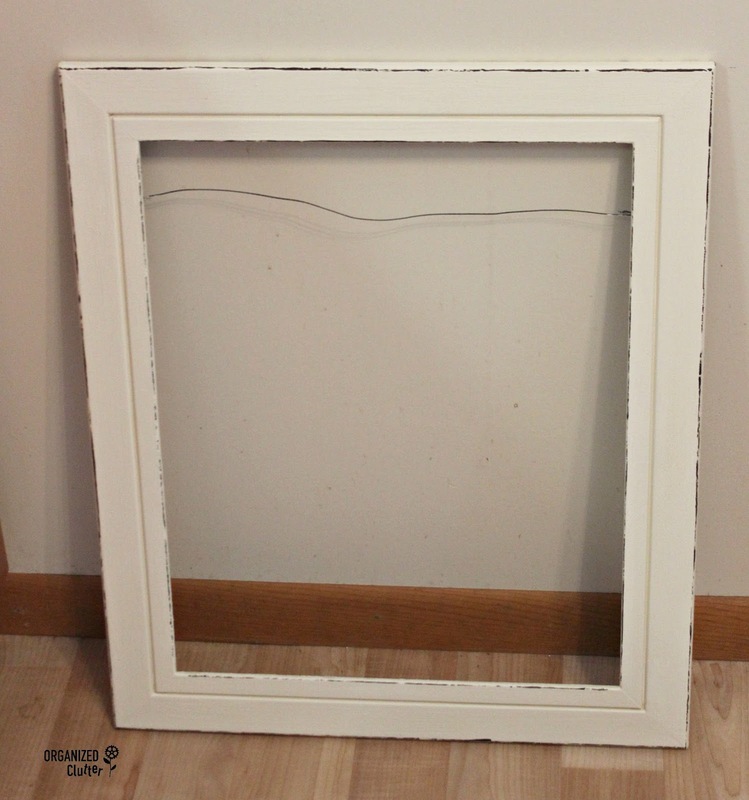 Love these ideas as I love to work with repainted thrift frames. You introduced me to the Layering Wood block and it is my favorite new tool!! Love your projects!